Don't limit your designs to round wire. We have square, flat, rectangular and specially shaped wire. Strip is available with normal mill edge as well as round edge, square edge, or slit & de-burred. Tempers are available from annealed to full hard. Standard raw material is bare wire but in-stock coatings include zinc, cad, tin, nickel, copper, galvanized and silver. 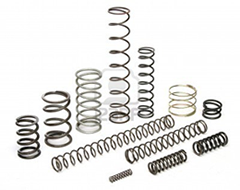 Spring Engineers has an extensive inventory of materials in-stock or readily available. Some special alloys or wire diameters may be special order items with extended lead-times so place your order now. Hastelloy - Haynes International, Inc.
Haynes 25 - Haynes International, Inc.